Monocot and dicot are the two lineages of plants found in angiosperms. Angiosperms are flowering plants. They are the most successful, dominant as well as the diversified plants on earth. Over 250,000 species of herbs, shrubs and woody plants are found in angiosperms. Monocot and dicot differ in their roots, stem, leaves, flowers and seeds. The main difference between monocot and dicot is that monocot contains a single cotyledon in its embryo whereas dicot contains two cotyledons in its embryo. Monocot is more precisely called monocotyledon. It is a lineage of angiosperms, which contains one embryonic leaf in the seed. Embryonic leaves are also called cotyledons. The embryonic leaf of the monocot is long and narrow. Monocot contains a large endosperm in the seed in order to feed the embryo. Orchids, grasses like sugar cane and bamboo, cereal grains like rice, wheat, and corn, crops like palm and banana, asparagus like onion and garlic and horticultural plants like lilies, daffodils and tulips are monocots. 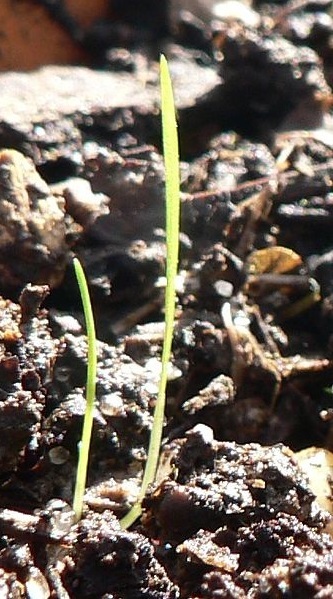 The sprouting of monocot grass, poales, with a single embryo leaf is shown in figure 1. The leaves of the monocot are also long and narrow. Monocot contains their veins in straight lines, up and down of the leaf, like in Washingtonia. Some veins start from the center of the leaf and run to the edges parallel to each other like in canna. The stem of the monocot is unbranched and fleshy and always contains a protective sheath made up of old leaves, protecting the new leaves. Monocot contains numerous vascular bundles in the stem, which scatter all over in the ground parenchyma. There is no separation between cortical and stelar regions in the stem as well. Monocot stem lacks a cambium. Shoots of the monocot are short and hair-like. They usually form bulbs during their vegetative reproduction. The parts of the flower like sepals, petals, and stamens occur in threes (trimerous) or multiples of threes, six or nine. Sepals of the flower exhibit the same color found in petals. The seed pods and the fruits of the monocot contain three parts. Seeds are usually large and fleshy. Both the largest seed, Coco-de-Mer as well as the smallest seed, Orchid seed in the world are monocts. 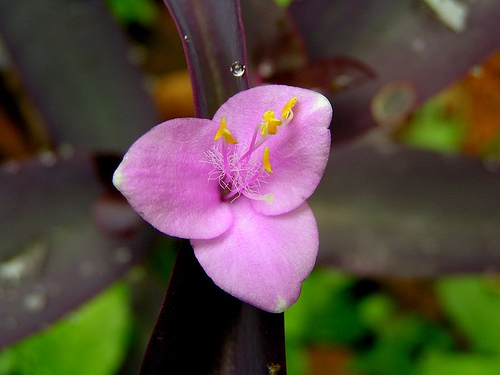 A monocot flower, Tradescantia pallida is shown in figure 2. Dicot is more precisely called dicotyledon. It contains the species of angiosperm, which are incapable of being classified under monocots. Dicots usually contain two embryonic leaves in the seed. Embryonic leaves of the dicot are broad. They are fatter than the true leaves of the plant. The shape of the embryonic leaves is different from true leaves as well. The seed of the dicot contains a tiny endosperm, feeding the embryo, while in germination. Most of the woody plants are dicots. 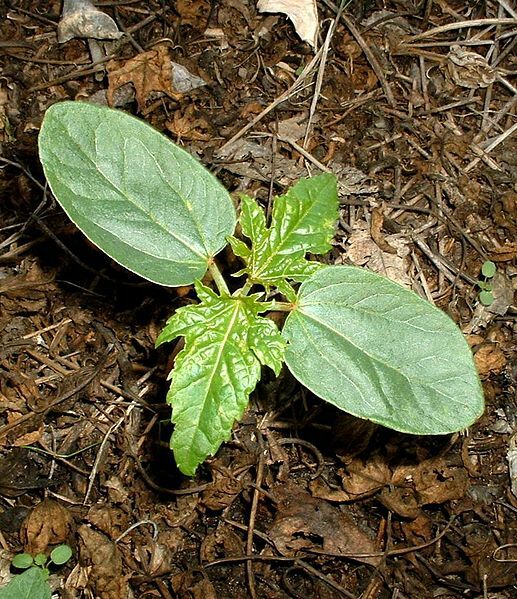 The young castor oil plant, which is a dicot is shown in figure 3. The prominent two embryonic leaves are different in shape compared to true leaves. Different shapes and sizes are found among dicot plants. Most of the dicot leaves are round in shape. The veins of the dicot start from the central midrib and run to the edges of the leaf, joining the crossings in order to form a netted pattern all over the leaf. The hard stem of the dicot is branched and grow wider in each year. A ring of primary vascular bundles is found along with the cambium in the dicot stem. The stem of the dicot is differentiated into cortex and stele. The root system of the dicot consists of a single, long tap root with small roots growing from the taproot. The flower parts of the dicot usually occur in fours (tetramerous) and fives (pentamerous). Sepals are found as a separate ring under the corolla called calyx, which is usually in green color. The seed pods and fruits are highly variable in shape of dicots. The chambers in the seed pod can be any number. Hence, more seeds are contained in the seed pods of dicots than monocots. The difference between dicot and monocot stem is shown in figure 4. Monocot: Monocot is called monocotyledon. Dicot: Dicot is called dicotyledon. Monocot: Monocots are mostly herbaceous. Some are occasionally arboraceous. Dicot: Dicots are either herbaceous or arboraceous. Monocot: The embryo of the monocot contains only one cotyledon. Dicot: The embryo of the dicot contains two cotyledons. Monocot: Monocot contains a large endosperm inside the seed, feeding the embryo plant. Dicot: Dicot contains a tiny endosperm inside the seed. Monocot: Monocot produces a single leaf, which is long and narrow during the germination of the seed. Dicot: Dicot produces two leaves, which are in a different shape to the true leaf. Monocot: Monocot usually contains long and narrow leaves. Dicot: Dicot usually contains wider leaves, but their shapes are highly varied depending on the species. Monocot: Monocot contains a parallel venation system. Dicot: Dicot contains a reticulate venation system. Monocot: The stem of the monocot is unbranched and fleshy. Dicot: The stem of the dicot is branched and hard. Dicot: The stem of the dicot grows wider in each year. Monocot: Monocot contains scattered vascular bundles all over the ground parenchyma. Dicot: Primary vascular bundles form a ring in the stem. Monocot: Monocot does not contain a cambium. Dicot: Dicot contains a cambium between xylem and phloem. Monocot: Monocot lacks differentiation of the stem into cortex and stele. Dicot: Dicot consists of the stem differentiation into cortex and stele. Monocot: Monocot contains a fibrous root system. Dicot: Dicot contains roots, growing from the main taproot. Monocot: Parts of the flower in monocot is trimerous. Dicot: Parts of the flower in dicot are either tetramerous and pentamerous. Monocot: Monocot pollen is monocolpate or contains a single aperture. Dicot: Dicot pollen is tricolpate. Monocot: Seed germination of monocot is hypogeal. Dicot: Seed germination of dicot is either hypogeal or epigeal. Monocot: Grasses, cereal grains, palm, and banana are the examples of monocots. Dicot: Legumes, tomato, and oak are the examples of dicots. Monocot and dicot are two types of flowering plants. The seed of the monocot produces a single embryo leaf while in germination. In contrast, dicot produces two embryo leaves, which are fatter and in different shapes compared to the true leaves. Monocot contains an unbranched stem while the stem of the dicot is branched and grows wider in each year by the process called secondary growth. Vascular bundles are scattered all over the stem in monocot whereas they are arranged into a ring in the dicot. Monocot contains a fleshy, fibrous roots and dicot contains roots, growing from the main taproot. Leaves of the monocot are usually thin and long. Leaves of the dicot contain a variety of shapes, but generally they are round in shape. Flowers are trimerous in the monocot and they are tetramerous and pentamerous in the dicot. However, the main difference between monocot and dicot is in the number of embryo leaves found in the seed. 1. “Monocots versus Dicots.” Monocots vs. Dicots. N.p., n.d. Web. 30 Apr. 2017. 2. Wise, Nicole. “The Science Behind Holganix: Monocots vs Dicots: What You Need To Know.” HOLGANIX The Natural Green Solutio. N.p., n.d. Web. 30 Apr. 2017. 3. Monocots and Dicots. N.p., n.d. Web. 30 Apr. 2017.